I will now perform an investigation to confirm the legitimacy of this formula and confirm a value for ρ in a Nichrome wire. 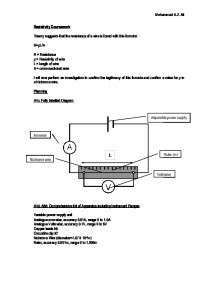 Confirm the Initial power supply is at 0 volts other wise huge voltages will most likely cause unnecessary heating in wires including the Nichrome not only a hazard but may compromise my readings. 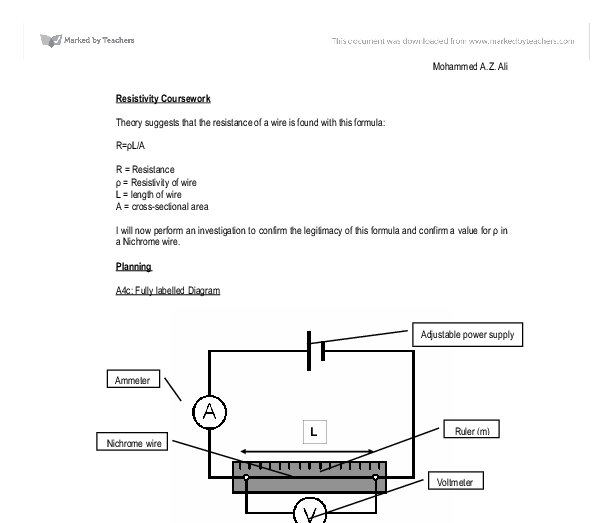 Make sure my practical investigation is free of all or any obstructions; any unnecessary wires may cause a short circuit leading to damaging the power supply unit, ammeters and voltmeters. Which is a very low power rating, this quality should sustain a constant temperature of the resistor. The graph should be a straight line through the origin where resistance(R) is proportional to length (m). This is a well written report that has an appropriate structure. 1. There is a running commentary that should be removed. 2. The conclusion is very brief and does not attempt to explain the patterns that have been found. 3, The evaluation should suggest further research opportunities. In fact the Resistance of a wire is equal to the potential difference applied divided by the current flowing through it (i.e. R=V/I)? So as the length of the wire is increased the number of collisions the current carrying charged particles make with fixed particles also increases and therefore the value for the Resistance of the wire becomes higher. The results are very consistent and accurate. There is one anomalous result. This was in the second test this may have been due to misreading of the ruler or heating of the water to long. It can be difficult to get conditions identical for every time we carry out the experiment, as identical conditions are essential for 100% accurate results. Copper is a better conductor than iron. When the electrons are moving through the metal structure they collide into the metal ions and this causes resistance to the electron flow or current. In different conductors the ease of flow of the electrons is different and so the conductors have different resistance. 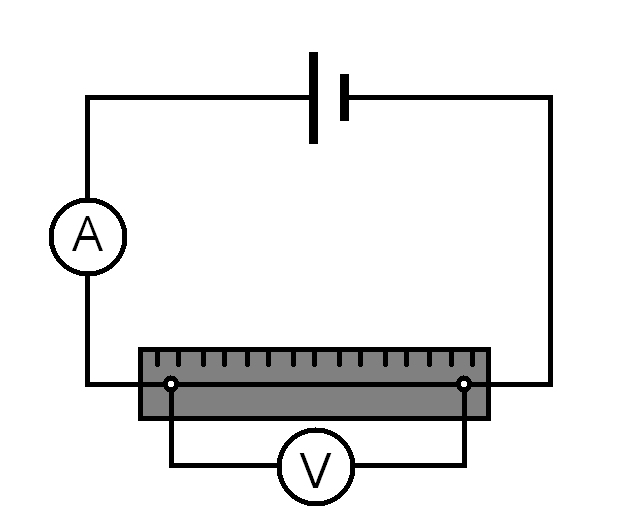 * Voltmeter - To measure the p.d. in the circuit to then find out the resistance. This is accurate to 0.01V. * Ammeter - To measure the current in the circuit to then find out the resistance. This is accurate to 0.01A.